This is a prime lens manufactured by Canon and the model was launched 2005. The lens has a focal length of 60 mm. Since the lens is designed to be used on a camera with smaller sensor ('APS-C') the focal length will be equivalent to 96 mm on your Canon camera. There is a lens hood that fits the lens (model name "ET-67B") but unfortunately this is something that is not included when purchasing the lens and must be ordered and bought separately, as an accessory. Text from Canon: "Canon’s EF-S60mm f/2.8 Macro USM, a medium-length macro lens for EF-S lens-compatible digital SLR cameras, marks the first macro lens in the company’s EF-S series lineup. Accordingly, the lens is ideally suited for use with the EOS Kiss Digital N, announced today, as well as the highly acclaimed EOS 20D advanced-amateur model launched in September 2004. The EF-S60mm f/2.8 Macro USM utilizes a smaller image circle and a short back focal distance to enable macro photography up to life-size 1:1 magnification and a focal length equivalent to 96mm (35mm format), while also making possible a highly compact, lightweight design. The lens employs an inner focusing system in which the first lens group is fixed in position and the second through fourth lens groups move independently in a three-group floating system. This system, also featured in the EF100mm f/2.8 Macro USM lens for 35mm cameras released in March 2000, combines high image quality at all focusing lengths with a 90 mm working distance in 1:1 macro mode, the longest in its class*. As a result, users need not worry about the front of the lens touching the subject when shooting macro photos. The EF-S60mm f/2.8 Macro USM´s lens element positioning and lens coating have been optimized to ensure excellent color balance while minimizing the flare and ghosting that can easily occur when the lens is used with a digital camera. 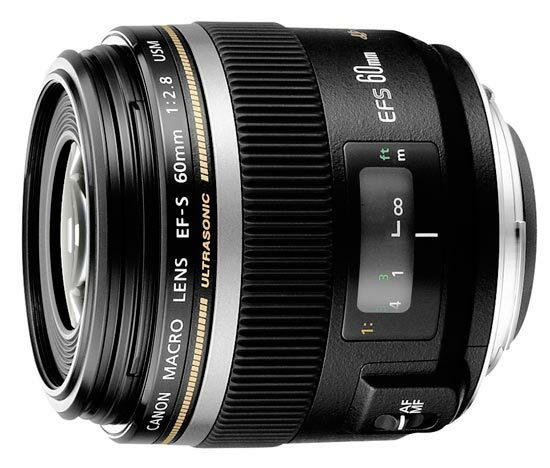 In consideration of the environment, the EF-S60mm f/2.8 Macro USM uses only lead-free glass optics and was designed in anticipation of the EU´s Restriction of Hazardous Substances in Electrical and Electronic Equipment (RoHS) Directive, which is due to take effect in July 2006. A thoroughly modern design that´s optimized for select Canon EOS digital SLRs. Its angle of view is equivalent to a 96mm lens on a 35mm camera, with a floating optical system that can focus down to full life-size (1:1) magnification. Inner focusing, driven by a silent and powerful ring-type USM, means the lens´ overall length never changes during focus. This lens is a wonderful multi-purpose lens that´s equally at home shooting macro shots, portraits or available-light photos. Like all Canon EF-S Lenses, its use is restricted to the EOS 20D, EOS Digital Rebel and EOS Digital Rebel XT cameras (as of February 2005)."